We provide full range of services including engineering, setup and maintenance of permanent, temporary, rigid or flexible, horizontal or vertical lifeline protection systems. We are authorised partners for the Latchways fall protection products. 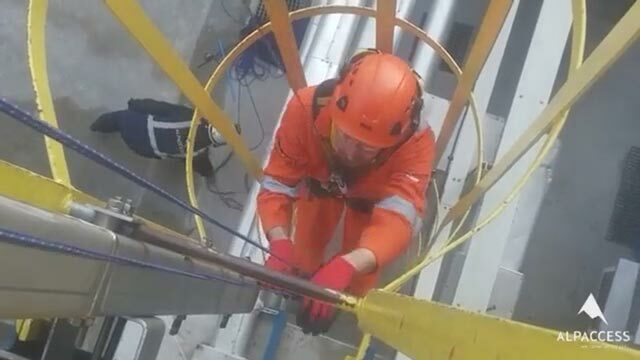 Based on our rope access experience we provide full range of services including engineering, setup and maintenance of the systems. DROPS Member: An industry-wide initiative focused on preventing dropping objects. ISFP Member: The international society for fall protection. SAIA Member: Global organisation on scaffolding erection and other access methods. IRATA Member: Industrial Rope Access Trade Associations. SPRAT Member: Society for Professional Rope Access Technicians. We are qualified by our extended coatings application and inspection experience to apply the Kemperol Fallstop, skylight protection system. The Fallstop system consists in a special clear coating applied to skylights that will protect the skylight from breaking in case a person falls on it, preventing the person to fall through. The widest spread cause of work related accidents is falls from height. A fall protection system prevents access in the dangerous area (if it’s a work restrain system) or minimises the consequences of a fall (in case of a fall arrest system). By the type, they can be work restrain or fall protection system. By the duration of use, they can be temporary or permanent lifeline systems. The systems can be rigid with a slider on or inside a rail, or flexible with a slider running on a steel or stainless steel cable. By their setup, they can be vertical, horizontal or diagonal. Our systems can be setup in a wide variety of configurations, practically following the outline of the building. All our systems are suitable to be used in critical areas, e.g. : explosive atmospheres. Any lifeline system provided by AlpAccess is certified in accordance with EN795:2012 standard. AlpAccess is the Romanian partner of Latchways PLC, and we install the fall protection lifeline systems provided by Latchways. AlpAccess is an authorized installer for the skylight protection system, Kemperol Fallstop, from Kemper System.